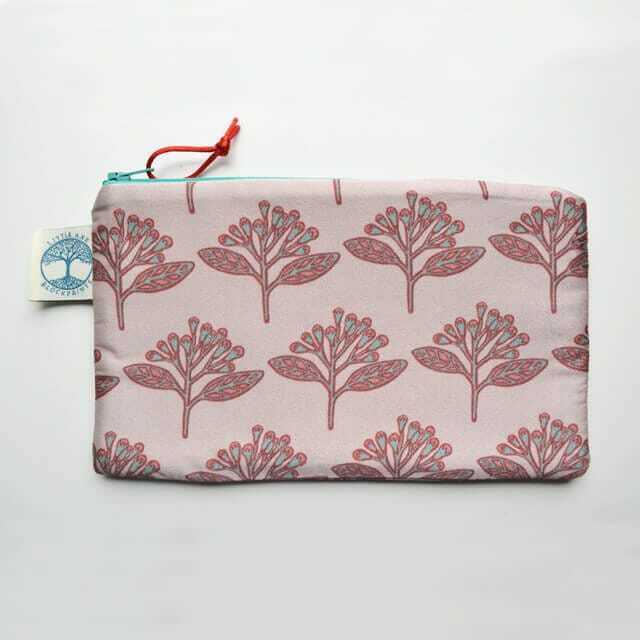 Little Axe Silk Bags are digitally printed and feature Ursula Hunters signature hand coloured Lino blocked designs. 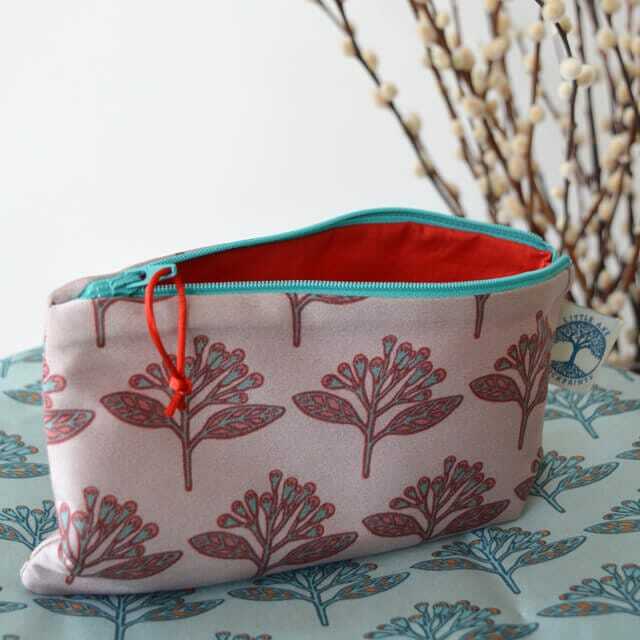 Little Axe Silk Bags are digitally printed and feature Ursula Hunters signature hand coloured Lino blocked designs. 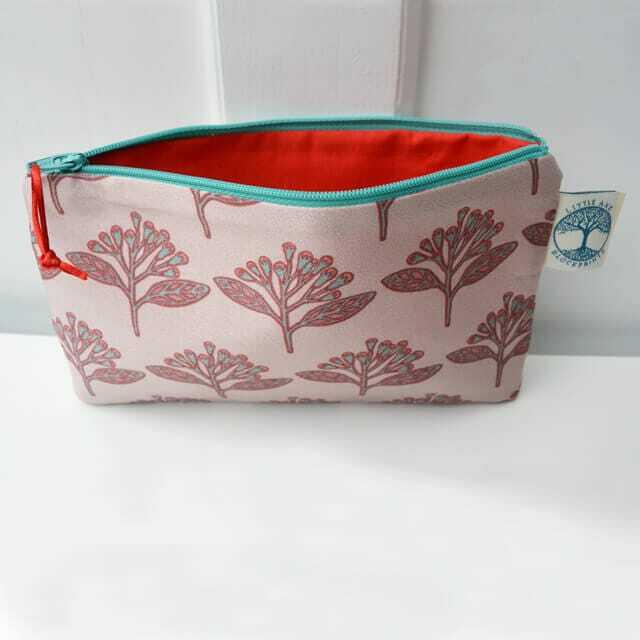 All of our bags are hand sewn and lined with cotton in a complimentary colour. Especially good for makeup, add some vibrant luxury to your handbag. Cloves is a hand block printed repeat design featuring the flower head of the Cloves plant found in the Moluccas. It is one in a series of Spice Plant designs created as part of a Spice Routes series in 2016. These designs celebrate the once rare culinary spices now commonly found in the kitchen. I wanted to go to Art School from an early age and graduated from Glasgow School of Art in the early 90s with a BA in Environmental Art. After working in community arts for over a decade, in 2012 I decided I wanted to establish my own design practice and reconnect with contemporary designers and makers. I went back to study for an MA in Illustration at Edinburgh College of Art, which was hugely inspirational. I established Little Axe in 2014 beginning quite literally from the kitchen table to produce hand block printed designs for Wallpaper and Textiles. I have a love of traditional craft and aim to use locally sourced materials and make sure all of my products are hand made in Britain. Initially I sold my products at local Craft Fairs but later went on to showcase with Handmade in Britain at Kew Gardens in London in 2015. Since then the company has grown steadily, now we now take commissions from restaurants and interior designers for our bespoke hand printed designs and handmade products. My work is all about nature, plants and animals, flora and fauna. I focus mostly on rare or endangered species, particularly the ones that are disappearing from the environment due to climate change and habitat loss. I want my work to convey meaning and I’m interested in our relationship to nature, I suppose it’s an attempt to bring nature back into our lives wherever we are. My wallpapers feature dense foliage, rare animals and rolling seas. The early textile collections were based on the wild habitats and shorelines of my native Scotland. But last year I made a collection that was inspired by the Spice Trade in the 17th century, so it features more exotic plants such as the Vanilla Orchid, the Black Pepper Vine and the Cloves plant. I’m currently working to commission on a new series of block printed designs inspired by the plants of the foothills of the Italian Alps. I hope as Little Axe Blockprints becomes more widely known to establish partnerships with British based makers that could take my designs to the next level.